A Natural Source of Omega 3? Canned Mackerel—A Natural Source of Omega 3? 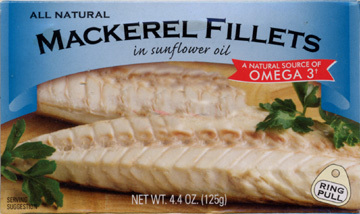 The label shown below, taken from a can of mackerel fillets, boasts that its contents are a natural source of omega 3 (1,130 mg per 4.4-oz serving). Aside from the question of what an unnatural source would be, the more-important question is whether or not the omega 3 contained therein has been damaged. There is no question that freshly caught, raw mackerel is a source of omega 3. But one suspects that, once the mackerel is exposed to high-temperature steam during the canning process, the fragile omega 3 fatty acids, which break down very easily with heat, have been damaged and possibly converted to free radicals. Free radicals are molecules, which, when ingested, latch onto the molecules of cells and change and disrupt their functioning. Whereas omega 3 fatty acids are essential to the functioning of every cell in the human body, they are sparse in the diets of most people. That fact, combined with the harmful effects of damaged omega 3s, makes it doubly important that they are consumed in the freshest possible form. A label, taken from a can of mackerel fillets, boasting that its contents are a natural source of omega 3. A much-better way of eating mackerel is to buy it fresh and sauté it very gently—not as convenient as the canned version, but much better for you. I don’t know if flax oil, which has been pressed under low temperature, dated, and stored under refrigeration in a dark container, would be considered to be less natural than a can of mackerel. Nevertheless, I prefer to obtain my omega 3 from such a rich vegetable source for the following reasons: (1) A vegetable source—especially an organic one—is less likely to be contaminated by pollutants such as mercury, PCBs, etc. (2) Harvesting some of the animal sources of omega 3 from the ocean have resulted in depleting regions of the ocean of vital organisms on which other, larger fish depend.